March 27, 2013: Over the years, the spacefaring nations of Earth have sent dozens of probes and rovers to explore Mars. Today there are three active satellites circling the red planet while two rovers, Opportunity and Curiosity, wheel across the red sands below. Mars is dry, barren, and apparently lifeless. For comparison, the asteroid strike that ended the dinosaurs on Earth 65 million years ago was about three times as powerful, 100 million megatons. Another point of comparison is the meteor that exploded over Chelyabinsk, Russia, in February of 2013, damaging buildings and knocking people down. The Mars comet is packing 80 million times more energy than that relatively puny asteroid. An impact wouldn't necessarily mean the end of NASA's Mars program. But it would transform the program-- along with Mars itself. "I think of it as a giant climate experiment," says Michael Meyer, lead scientist for the Mars Exploration Program at NASA headquarters. "An impact would loft a lot of stuff into the Martian atmosphere--dust, sand, water and other debris. The result could be a warmer, wetter Mars than we're accustomed to today." Meyer worries that solar-powered Opportunity might have a hard time surviving if the atmosphere became opaque. Nuclear-powered Curiosity, though, would carry on just fine. He also notes that Mars orbiters might have trouble seeing the surface, for a while at least, until the debris begins to clear. A direct impact remains unlikely. Paul Chodas of NASA's Near-Earth Object Program stresses that a 1 in 2000 chance of impact means there's a 1999 in 2000 chance of no impact. "A near-miss is far more likely," he points out. Even a near miss is a potentially big event. The latest orbit solutions put the comet somewhere within 300,000 km of the red planet at closest approach. That means Mars could find itself inside the comet's gassy, dusty atmosphere or "coma." Visually, the comet would reach 0th magnitude, that is, a few times brighter than a 1st magnitude star, as seen from the Red Planet. "Cameras on ALL of NASA's spacecraft currently operating at Mars should be able to take photographs of Comet 2013 A1," says Jim Bell, a planetary scientist and Mars imaging specialist at Arizona State University. "The issue with Mars Odyssey and the Mars Reconnaissance Orbiter will be the ability to point them in the right direction; they are used to looking down, not up. Mission designers will have to figure out if that is possible." "The issue with the Opportunity and Curiosity rovers will be power for imaging at night," he continues. 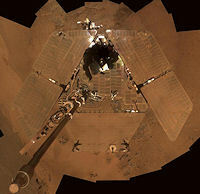 "Opportunity is solar powered and so would need to dip into reserve battery power to operate the cameras at night. Whether or not we will be able to do this will depend on how much power the rover is getting from dusty solar panels in the daytime. On the other hand, Curiosity is nuclear powered, so it could have better odds at night-time imaging." Researchers will be keenly interested to see how the comet's atmosphere interacts with the atmosphere of Mars. For one thing, there could be a meteor shower. "Analyzing the spectrum of disintegrating meteors could tell us something interesting about the chemistry of the upper atmosphere," notes Meyer. Click to view an interactive 3D orbit of Comet 2013 A1. Another possibility is Martian auroras. Unlike Earth, which has a global magnetic field that wraps around our entire planet, Mars is only magnetized in patches. Here and there, magnetic umbrellas sprout out of the ground, creating a crazy-quilt of magnetic poles concentrated mainly in the southern hemisphere. Ionized gases hitting the top of the Martian atmosphere could spark auroras in the canopies of the magnetic umbrellas. Even before the comet flyby was known, NASA had already decided to send a spacecraft to Mars to study the dynamics of the Martian atmosphere. If the probe, named MAVEN (short for "Mars Atmosphere and Volatile Evolution"), is launched on time in November 2013, it would reach Mars just a few weeks before the comet in 2014. 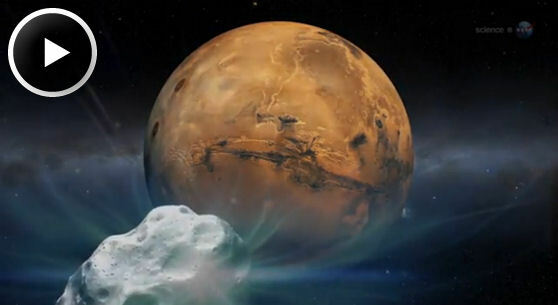 However, notes MAVEN's principal investigator Bruce Jakosky of the University of Colorado, the spacecraft won't be ready to observe the comet when it reaches Mars. "It takes a while to get into our science mapping orbit, deploy the booms, turn on and test the science instruments--and so on," he explains. "MAVEN won't be fully operational until perhaps two weeks after the comet passes. There are some effects that I would expect to linger for a relatively long period--especially if the comet hits Mars--and we will be able to observe those changes." Astronomers around the world are monitoring 2013 A1. Every day, new data arrive to refine the comet's orbit. As the error bars shrink, Yeomans expects a direct hit to be ruled out. "The odds favor a flyby, not a collision," he says. Either way, this is going to be good. Stay tuned for updates as the comet approaches.